This program is free software; you can redistribute it and/or modify it under the terms of the GNU General Public License as published by the Free Software Foundation, either version 2 of the License, or (at your option) any later version. 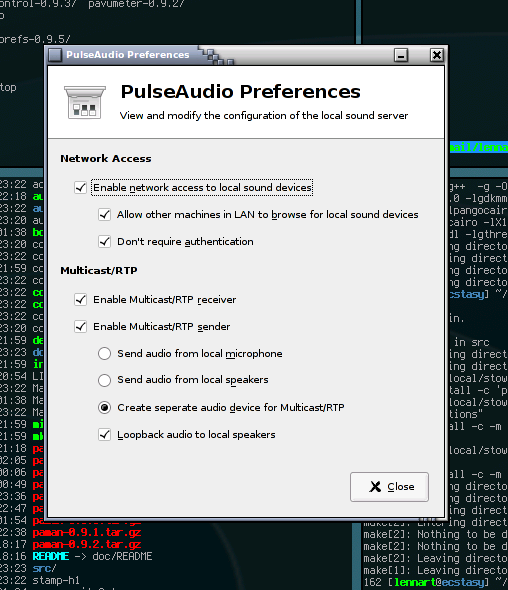 PulseAudio Preferences (paprefs) is a simple GTK based configuration dialog for the PulseAudio sound server. There is not much to say. Just run paprefs and see for yourself. Currently, paprefs is tested on Linux only. paprefs was developed and tested on Debian GNU/Linux "testing" from August 2006, it should work on most other Linux distributions (and maybe Unix versions) since it uses GNU autoconf for source code configuration. paprefs requires gtkmm and glademmm installed. Obviously paprefs requires an installation of PulseAudio (version 0.9.5). The module module-gconf must be loaded in the daemon. There is an implicit dependency on PackageKit. If you don't install PackageKit the 'Install' buttons in the UI for installing necessary PulseAudio plugins won't work. As this package is made with the GNU autotools you should run ./configure inside the distribution directory for configuring the source tree. After that you should run make for compilation and make install (as root) for installation of paprefs. Colin Guthrie for the RAOP support and other fixes.